If you are not familiar with their product line, the British company, Games Workshop, Ltd., markets tabletop (if you have a big table) miniatures games, in which you field an army of small painted sculptures (typically about 25–28mm high for a human character) and maneuver them according to the game rules, resolving combat (including magic spells and the like) by rolling dice to determine the outcome. Actually, what GW markets is not just games, but an entire hobby. They sell the rulebooks (the new rulebook for the Middle-earth Strategy Battle Game, which is used as the basis for an unlimited number of battle scenarios, is 208 pages long), miniatures, paints and brushes for the miniatures, painting guides, scenario packs, and so on; and also sponsor tournaments and similar activities through their own chain of hobby stores. Needless to say, it is possible to invest quite a lot of time and money into this hobby. 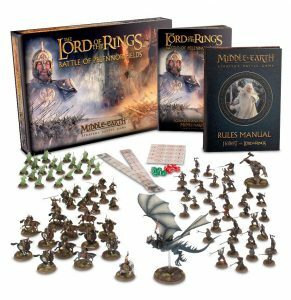 In recent years, GW has been facing falling profits, and fans of their Middle-earth products were uncertain as to whether they might drop the expensive license rather than continuing to support the line. Apparently, they have renewed the license for a few years, and the response from their existing customer base has been quite positive. The present product is intended as a “starter” product intended to attract new people into the hobby. However, it is a large and rather expensive product: it contains 84 unpainted plastic miniatures: 24 Rohan warriors and riders, 20 Warriors of the Dead, 36 Morannon Orcs, a Mordor Troll, and the Witch-king of Angmar on his flying ‘Fell Beast’ are all reissues of previous models; and Théoden, King of Rohan appears in two brand-new models, one mounted and one on foot. 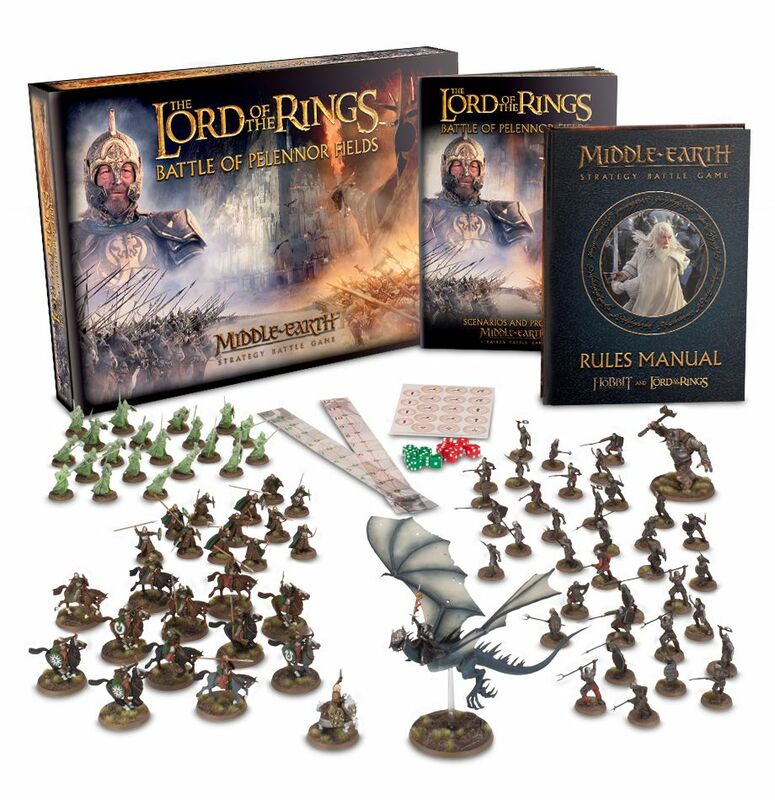 It also includes: the new hard-bound 208-page rulebook and a 16-page scenario booklet providing the rules for four scenarios using the miniatures in the box; 12 dice; a pair of range rulers to govern movement; assembly instructions for the models; and a small sheet of cardboard game state tokens. The US price for this big box is $150, so it is quite an investment: and most people will be unsatisfied with playing the game with the unpainted figures and will want to invest more time and money into painting them up (and perhaps buying suitable ground terrain from a model train store). As noted, GW sells a whole hobby, not just games. Like many game companies, GW has to walk an uncertain line between attracting and appealing to new players, and supporting long-standing customers with new content. It remains to be seen whether GW has succeeded on both counts with this new product. 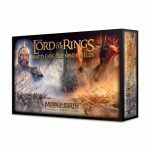 While expensive, it really is quite a reasonable value for a game of this type (GW sells the rulebook, a new streamlined consolidation of the previous ‘Hobbit’ and ‘Lord of the Rings’ rules, for $60 as a separate item). It includes a very large number of miniature figures, and the unique figures (Witch-king, Troll, Théoden) look excellent. On the other hand, it is a bit peculiar from a story standpoint. The presence of the Army of the Dead on the fields of Pelennor is a movie element – GW’s license is based on the movies – and even at that, they do not arrive until Théoden has departed the field, so it is a peculiar choice. I conjecture that it was an artistic and game decision. 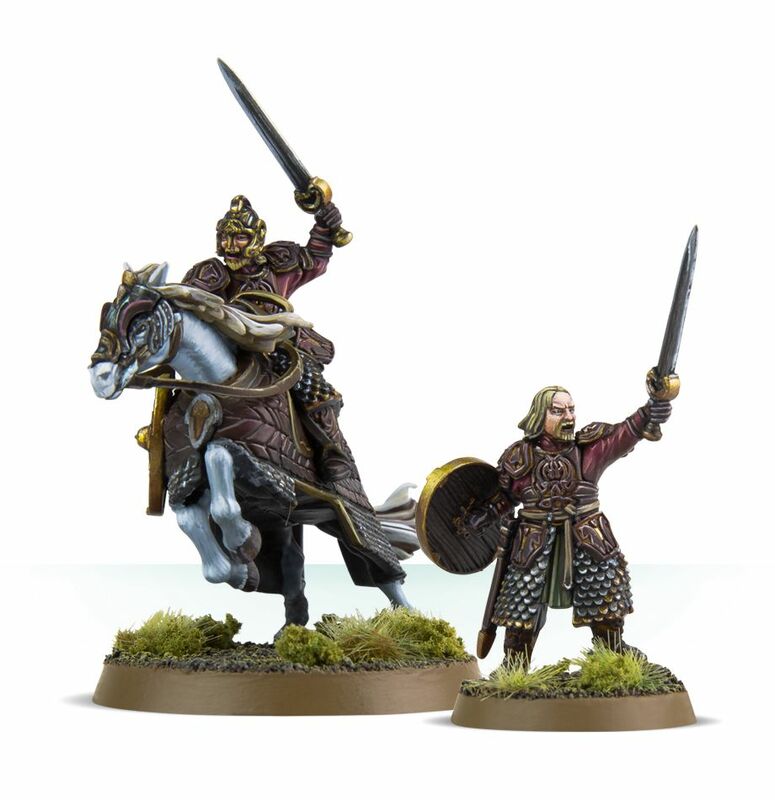 Adding their existing Knights of Dol Amroth figures would have been a bit superfluous given the Riders of Rohan; and a bunch of Gondor regulars would perhaps have been a bit bland. All in all, for someone with the money and time (and table space) to spend who might have been thinking about getting into these games, this is probably as good an entry point as you will see. If you are already a fan of the line and are interested in the new rulebook and the sculpts, this will probably appeal. See The Games Workshop site for complete information.